The endocannabinoid CB2 receptor system has been implicated in the neuropathology of Alzheimer’s disease (AD). In order to investigate the impact of the CB2 receptor system on AD pathology, a colony of mice with a deleted CB2 receptor gene, CNR2, was established on a transgenic human mutant APP background for pathological comparison with CB2 receptor-sufficient transgenic mice. J20 APP (PDGFB-APPSwInd) mice were bred over two generations with CNR2−/− (Cnr2tm1Dgen / J) mice to produce a colony of J20 CNR2+I+ and J20 CNR2−/− mice. Seventeen J20 CNR2+I+ mice (12 females, 5 males) and 16 J20 CNR2−/− mice (11 females, 5 males) were killed at 12 months, and their brains were interrogated for AD-related pathology with both biochemistry and immunocytochemistry (ICC). In addition to amyloid-dependent endpoints such as soluble Aβ production and plaque deposition quantified with 6E10 staining, the effect of CB2 receptor deletion on total soluble mouse tau production was assayed by using a recently developed high-sensitivity assay. Results revealed that soluble Aβ42 and plaque deposition were significantly increased in J20 CNR2−/− mice relative to CNR2+/+ mice. Microgliosis, quantified with ionized calcium-binding adapter molecule 1 (Iba-1) staining, did not differ between groups, whereas plaque associated microglia was more abundant in J20 CNR2−/− mice. Total tau was significantly suppressed in J20 CNR2−/− mice relative to J20 CNR2+/+ mice. The results confirm the constitutive role of the CB2 receptor system both in reducing amyloid plaque pathology in AD and also support tehpotential of cannabinoid therapies targeting CB2 to reduce Aβ; however, the results suggest that interventions may have a divergent effect on tau pathology. The primary neuropathological hallmarks of Alzheimer’s disease (AD) comprise amyloid-β (Aβ) deposits and neurofibrillary tangles composed of abnormally phosphorylated tau protein in the brain parenchyma (1). Deposition of Aβ in brain is known to induce microgliosis (2) and attendant cytokine production (3), events believed to be important drivers of the pathogenic cascade (4). There is a gathering interest in the potential utility of cannabinoid interventions for the prevention or treatment of AD pathology, predicated on both the robust immune response evidenced in AD pathology and the utility of cannabinoids in dampening inflammatory pathways. The endocannabinoid system comprises at least two biolipid signaling molecules produced on demand in a wide spectrum of cell types and tissues, including neurons and immune cells of the central nervous system, that bind to at least two cannabinoid receptors, CB1 and CB2 (5). The CB2 receptor is expressed primarily in immune-competent cells and functions as a feedback inhibitor of inflammatory cytokine production (6). There is evidence that perturbations in the endocannabinoid system may be either a risk factor for or a biomarker of AD. In a discovery-based gene expression experiment using microarray, CNR2, the gene encoding the CB2 receptor, was one of a select group of genes (from Gene Chip of approximately 45,000 genes) identified as having increased expression in AD brain compared with age-matched control brains (7). This study was followed by an investigation of mRNA expression in the blood of subjects with AD in which expression of CNR2 was associated with AD and correlated with measures of cognitive impairment (8). 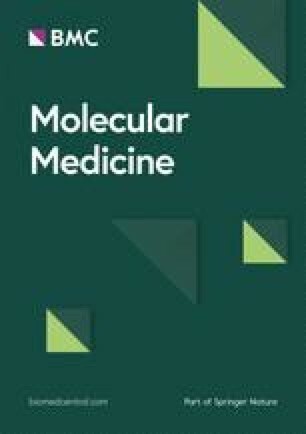 More recently, a study of mRNA expression and epigenic regulation of endocannabinoid system components in the periphery of AD patients relative to controls revealed an increase in the endocannabinoid-degrading enzyme fatty acid amide hydrolase (FAAH), an increase in FAAH protein levels, an increase in FAAH activity and a reduction in DNA methylation at the FAAH gene promoter (9). Neuropathological evidence supports the involvement of the CB2 receptor in plaque pathology of AD. Evidence of the involvement of this receptor in disease pathology emerged from a study in which selective expression of the receptor in neuritic plaque-associated microglia was demonstrated in regions implicated early in disease progression (hippocampus and entorhinal cortices) in AD patients (10). Recently, increased receptor expression in frontal cortex (Brodmann area 10) of AD patients with more advanced disease (Braak stage V/VI) was found to correlate with amyloid (Aβ) levels and plaque density score (11). The localization of CB2 receptor-positive microglia in regions of human AD pathology contextualized within the role of the immune cell-expressed CB2 receptor as a feedback inhibitor of immune responsiveness suggests a participatory role for this receptor system in the inflammatory pathology of AD and the potential for a novel target for intervention. Promising in vitro studies investigating cellular and pathological models have gradually given way to direct in vivo experiments focused on cannabinoid therapeutics for the interruption of the Aβ deposition cascade of AD. CB2 receptor stimulation in AD as a viable strategy for preventing Aβ-induced microglial activation and ameliorating cognitive impairment was first demonstrated in a nontransgenic animal model of AD (12). In this experiment, intracerebroventricular injections of Aβ or control peptide were administered to mice with and without a cannabinoid. As expected, activated microglia were observed in the cortex of Aβ-treated mice. It was demonstrated that cannabinoid treatment with Aβ prevented microglial activation and that although Aβ-treated mice manifested very typical AD model impairments of spatial navigation, the cannabinoid prevented this Aβ-induced cognitive impairment. Recently, investigators exposed 11-month-old transgene amyloid precusor protein (TgAPP) 2576 mice to prolonged treatment with a synthetic CB2 receptor agonist, JWH-133 (13). When compared with vehicle-treated mice, JWH-133 treatment reduced microgliosis, decreased soluble Aβ40 and Aβ42 and enhanced glucose metabolism in the hippocampus and cortical regions, suggesting that targeting the microglial CB2 receptor interrupts critical events in the amyloid cascade via a direct impact on microglial activation. A subsequent investigation with the same compound in APP/presenilin 1 (PS1) mice revealed that treatment induced cognitive improvement, as well as reduced expression of the proinflammatory cytokines interleukin (IL)-1β, IL-6, tumor necrosis factor (TNF)-α, and interferon (IFN)-γ (14). Recently, a novel CB2 agonist (MDA7) was shown to promote Aβ clearance, decrease IL-1β and improve memory in rats with cognitive impairment induced by bilateral microinjections of Aβ into the hippocampus (15). Beyond the impact on Aβ, cannabinoid interventions may influence tau processing, mediated by inflammatory pathways. Emerging evidence suggests that neuroinflammation may be a critical event in tangle production (16). From the perspective of cellular pathology, activated microglia have long been known to be spatially associated with tangle pathology (17). In a recent study, it was demonstrated that glial responses correlate positively with tangle burden and are more likely to be found in the vicinity of tangles (18). Relationships between inflammation and alterations in the processing of tau proteins have been suggested. Activated microglia cultured with cortical neurons induce tau phosphorylation, mediated by p38 mitogen-activated protein kinase pathways (19). In a mouse model expressing P301S-mutated tau, microglial activation preceded tangle formation, suggesting that inflammation may drive intraneuronal changes in tau processing (20). Lipopolysaccharide injection into the brains of mice expressing human mutant tau induces microglial activation and phosphorylation of tau (21,22). These data suggest that targeted interruption of inflammatory pathways in the absence of amyloid with cannabinoid therapies may influence tau processing and potentially tangle production. To investigate in what way the CB2 receptor is involved in AD pathogenesis, we designed an experiment to determine whether knocking out the CB2 receptor influences Aβ production, plaque deposition or related pathologies in APP transgenic mice. To this end, we established a colony of mice with a deleted CB2 receptor gene (CNR2) on a transgenic human mutant APP background for pathological comparison with CB2 receptor sufficient transgenic mice. In addition to Aβ-dependent endpoints, the effect of CB2 receptor deletion on total soluble mouse tau production and hyperphosphorylated tau (at a conformational changing epitope [Ser396/404] known to be a principal component of neurofibrillary tangles) were assayed by using a recently developed high-sensitivity assay created in our laboratory (23). CB2 receptor knockout mice (CNR2−/−). The Cnr2tm1Dgen/J knockout mouse was developed by homologous recombination resulting in a 334-base pair deletion in the coding exon of the CNR2 gene, with a neomycin gene insertion germinated in a C57/BL6 mouse. Macrophages from homozygous mutant mice lacking the CB2 receptor are resistant to the inhibitory effects of δ-9 tetrahydrocannabinol (24). Beyond alopecia, there are no other reported phenotypic aberrations in these mice (25). Consistent with the effects of the CB2 system on immune modulation, CNR2−/− mice have been reported to exhibit more severe experimental autoimmune encephalitis than wild-type mice as well as enhanced allergic responses (26,27). It has been previously demonstrated that CNR2−/− mice expressing the human mutant Huntington exon 1 (R6/2 mice) have increased microglial activation (detected via immunostaining with ionized calcium-binding adapter molecule 1 [Iba-1] antibody) and exacerbated disease progression when compared with CNR2+/+ R6/2 mice (28). Transgenic amyloid mice (J20). The J20 mouse expresses a mutant form of the amyloid precursor protein bearing the K670N/M671L and V717F mutations inserted via the human platelet-derived growth factor β polypeptide promoter into C57/BL6 × DBA/2 F2 one-cell embryos; hemizygous mice express transgene product in cerebral neurons, especially the neocortex and hippocampus (29). At 5 months of age, diffuse Aβ deposition in the dentate gyrus and neocortex is first evident. Plaques are evident in 50% of J20 mice by 7 months and nearly 100% of mice by 8 months and demonstrate a significant reactive microgliosis (29,30). J20 CNR2−/− mice. The goal of the present study was to establish a colony of transgenic amyloid mice lacking the CB2 receptor for comparison with transgenic amyloid mice with an intact CB2 receptor system (J20 CNR2−/− and J20 CNR2+/+). To create a strain of J20 CNR2−/− mice, J20 mice were backcrossed with J20 CNR2−/− mice over two generations, first producing a generation of J20 CNR2+/− mice, then J20 CNR2−/− mice. Mice were gender matched and raised to 1 year before being euthanized. All animal experiments were performed according to procedures approved by the Feinstein Institute for Medical Research Institutional Animal Care and Use Committee. CNR2 knockout (strain name B6.129P2-Cnr2tm1Dgen/J) mice and TgAPP [strain name B6.Cg-Tg(PDGFB-APPSwInd)20Lms/2Mmjax, also known as “J20”] transgenic mice, both on a C57BL/6 background, were obtained from The Jackson Laboratory (Bar Harbor, ME, USA). Genotyping was performed at Transnetyx (Cordova, TN, USA) from tail samples, by using a quantitative polymerase chain reaction (qPCR)-based system to detect the presence or absence of a target sequence within each sample. The APP probe was targeted to the human cDNA exon-exon junction sequence and detects the presence of that transgene within a sample. The CNR2 probe was targeted to a sequence in the disrupted CNR2 gene and detects the presence of a neomycin cassette within each sample. J20 CNR2+/+, J20 CNR2−/−, CNR2−/− and wild-type (WT) mice were group-housed (three to five animals per cage) with a 12:12-h light/dark cycle and with ad libitum access to water and food. At 52 wks of age (12 months), mice were killed. Brains were hemidissected, and one hemibrain was fixed with 4% paraformaldehyde in 0.1 molar phosphate-buffered saline (pH 7.6), whereas the other hemibrain was sequentially extracted, as described in previously published protocols (31). Paraformaldehyde-fixed brain hemispheres were dehydrated in ethanol, paraffin-embedded and cut with a microtome into 5-µm sagittal sections. Hemisectioned brains were homogenized and sonicated in Tris-buffered saline containing 2% sodium dodecyl sulfate (SDS) and 1 × cOmplete protease inhibitor mixture (Roche Applied Science, Indianapolis, IN, USA) and centrifuged at 100,000g for 1 h at 4°C. The supernatant was then removed, and the resulting pellet was extracted with 70% formic acid in water. The 2% SDS extracts were diluted 1:40. Formic acid extracts were neutralized initially by a 1:20 dilution into 1 mmol/L Tris phosphate buffer (pH 11) and then diluted as necessary to normalize protein concentration. Brain Aβ40 and Aβ42 were quantified using an enzymelinked immunosorbent assay (ELISA) kit following the manufacturer’s instructions [Human β Amyloid (1–40) ELISA Kit (cat. no. 292-62301) and Human β Amyloid (1–42) ELISA Kit (cat. no. 298-62401); Wako, Richmond, VA, USA]. ELISA plates were read on a Tecan GENios Pro reader (Tecan Group Ltd., Männedorf, Switzerland) at 450 nmol/L. Low-tau sandwich ELISA was performed to detect total tau (DA31) and pSer396/404 (PHF1) levels. Briefly, 96-well plates were coated with DA31 (or PHF1 at a final concentration of 6 µg/mL for 48 h at 4°C). After washing and blocking, 50 µL of each sample was added in duplicate, using the proper dilution in 20% SuperBlock (Thermo Scientific, part of Thermo Fisher Scientific Inc., Waltham, MA, USA): 1:10,000 for the DA31 ELISA (antibody-coated plates provided by P Davies), and 1:5,000 for the PHF1 ELISA (antibody-coated plates provided by P Davies), respectively. At the same time, 50 µL DA9-HRP detection antibody was added to the wells and tapped to combine. Plates were incubated overnight by shaking at 4°C. After washing, the 1-Step ULTRA TMB-ELISA substrate (Thermo Scientific) was added for 30 min at room temperature and then blocked with 2 mol/L sulfuric acid. Plates were read with an Infinite m200 plate reader (Tecan) at 450 nmol/L. The measured values were normalized according to the protein concentration. All ICC analysis took place in triplicate; three paraffin-embedded sections were selected from each mouse for each antibody representing equally staggered sagittal cutting intervals. For Aβ staining, sections were processed according to previously published protocols (32). Briefly, sections were pretreated with 70% formic acid for 15 min and immersed in 1% H2O2 for 30 min. Sections were then incubated with 5% milk in Tris-buffered saline for 1 h and with 6E10 primary antibody (1:1,000 dilution; Covance Inc., Princeton, NJ, USA) overnight at 4°C. Incubation with biotin-labeled goat anti-mouse IgG1 secondary antibodies (1:1,000 dilution; SouthernBiotech, Birmingham, AL, USA) was performed before incubation with streptavidin-horseradish peroxidase (SouthernBiotech) and diaminobenzidine tetrahydrochloride. For microglial staining, sections were first pretreated with Dako Target Retrieval Solution at 95°C for 30 min and then processed with a similar protocol by using the Iba-1 primary antibody (1:1,000 dilution; Wako), followed by biotin-labeled goat anti-rabbit secondary antibody (1:1,000 dilution; SouthernBiotech). Sections were observed with a light microscope, and pictures were generated by using an Olympus 5 megapixel camera (Olympus Corporation of the Americas, Center Valley, PA, USA). Image analysis for quantification of ICC (staining density) used grayscale thresholding and pixel estimation/conversion to percent area stained with ImageJ software (NIH, Bethesda, MD, USA; https://doi.org/imagej.nih.gov/ij), following previously described techniques (33). Percent area stained was then averaged for sections analyzed in triplicate from each mouse and compared by group (J20 CNR2+/+ versus J20 CNR2−/−). For cellular quantification of plaque-associated microglia, with Iba-1 staining, two representative plaques were selected from each mouse; plaques were identified by the characteristic clustering of reactive microglia in a circular profile, defining the circumference of the plaque. Iba-1-positive microglia were counted along the circumference of the plaques and then compared by group. Between-group statistical analyses were performed with unpaired Student t tests for differences between two-group means, and analysis of variance (ANOVA) where appropriate, by using GraphPad Prism Software (GraphPad Software Inc., La Jolla, CA, USA). To evaluate the impact of the CB2 receptor on amyloid pathology, microgliosis and tau processing, a colony of J20 CNR2+/+ and J20 CNR2−/− mice was established. A total of 17 J20 CNR2+/+ mice (12 female, 5 male) and 16 J20 CNR2−/− mice (11 female, 5 male) were euthanize after 1 year, and brain sections were taken for immunohistochemistry and biochemistry. The duration of the study was set at 1 year, to allow ample time for plaque production and microgliosis, while avoiding loss of mice from age-related mortality issues in the transgenic model. Because there have been reports of amyloid production being influenced by gender in transgenic models (34), the groups were matched for gender (one female J20 CNR2−/− mouse died before the 1-year time point). Our approach involved a combination of biochemistry interrogating levels of soluble Aβ40 and Aβ42, and immunohistochemistry for quantification of plaque pathology. Previous experiments have demonstrated that CB2 receptor stimulation in cell culture promotes successful phagocytosis of the Aβ42 peptide, the chief component of plaque pathology (35). This result would suggest that the absence of the receptor system would drive increases in Aβ42 and plaque pathology. When AD brains are compared with controls, both levels of soluble and insoluble (aggregated, plaque associated) Aβ increase, but there is a shift from soluble forms to insoluble forms such that, in AD, insoluble Aβ dominates the total fraction of amyloid in the brain, whereas in healthy controls, soluble forms predominate (36). CB2 receptor-mediated reduction in Aβ levels in J20 CNR2+/+ mice, mediated by phagocytosis of organized plaque, was predicted to be primarily evident in plaque size, with a secondary effect on soluble Aβ species as reservoirs of Aβ drop. The J20 CNR2+/+ and J20 CNR2−/− mice differed primarily on immunohistochemical measurements of plaque pathology, with a smaller impact on soluble Aβ species. 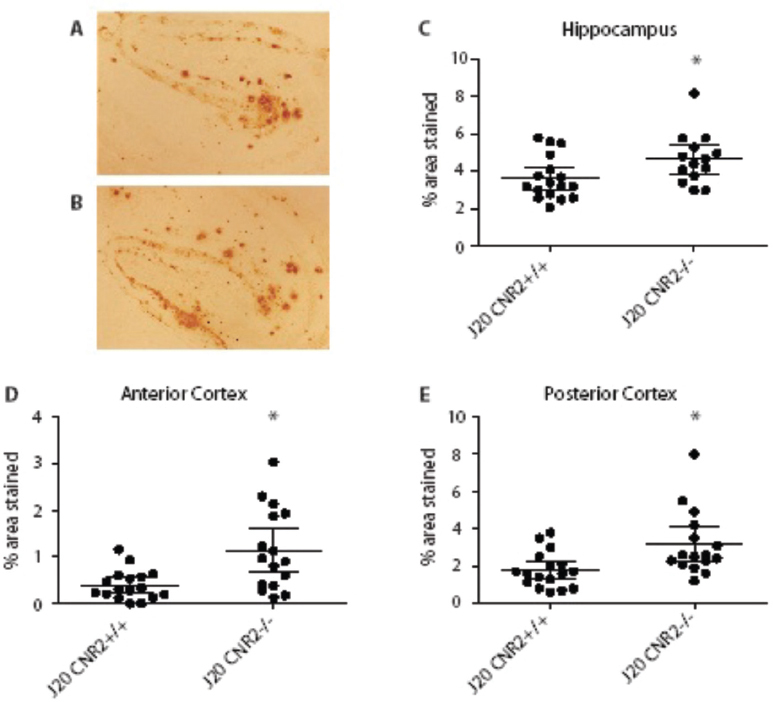 Plaque staining density assessed by ICC differed between groups, reflecting increased deposition in the hippocampus (Figure 1A–C), anterior cortex (Figure 1D) and posterior cortex (Figure 1E) of J20 CNR2−/− mice. This result is consistent with the expectation that any increase in pathology in J20 CNR2−/− mice would be driven by impaired microglial phagocytic reduction of plaques. The biochemical analysis, using ELISA to evaluate soluble forms, revealed that while soluble Aβ42 was significantly increased in CNR2-deficient mice (Figure 2B), soluble Aβ40 did not differ significantly between groups (Figure 2A). Because Aβ42− rather than the more common Aβ40− is known to be the more fibrillogenic isoform, the reported elevation is consistent with the evident increase in plaque pathology (37). (A, B) Representative sections at 4× magnification reflecting ICC staining sample means in mouse hippocampus (A: J20 CNR2+/+; B: J20 CNR2−/−). (C) Quantification of human amyloid ICC staining in mouse hippocampus using 6E10 monoclonal antibodies. Data are means and 95% confidence intervals. (D) Quantification of human amyloid ICC staining in anterior mouse cortex using 6E10 monoclonal antibodies. Data are means and 95% confidence intervals. (E) Quantification of human amyloid ICC staining in posterior J20 mouse cortex with 6E10 monoclonal antibody. Data are means and 95% confidence intervals. *p < 0.05. (A) Quantification of soluble Aβ40 in hemisectioned brains of CB2-deficient versus CB2-sufficient mice. Data are means. (B) Quantification of soluble Aβ42 in hemisectioned brains of CB2-deficient versus CB2-sufficient mice. Data are means and 95% confidence intervals). *p < 0.05. An increased microglial response was anticipated in J20 CNR2−/− mice. It has been demonstrated that the CB2 receptor stimulation has an immunosuppressive effect (38,39), blocking the production of proinflammatory cytokines (40) and that simulation of the CB2 receptor inhibits microglial activation. Direct CB2 receptor stimulation has been shown to prevent Aβ-induced microglial activation in an animal model of AD and improves cognitive outcomes, highlighting the negative consequence of microglial response in amyloid models (12). Mice lacking the CB2 receptor, deficient in the feedback inhibition of microglial activation that the receptor provides, would be expected under conditions of Aβ plaque deposition to evidence a higher density of microglial representation. To quantify microglial activation, our approach used immunohis-tochemical analysis of tissue with the microglial marker Iba-1. Iba-1 is a protein that is specifically expressed by macrophages and microglia and is upregulated under conditions of activation (41). Microgliosis, quantified with immunohistochemistry (Iba-1) staining density did not, contrary to expectation, differ significantly between J20 CNR2−/− and J20 CNR2+/+ mice (Figure 3A). However, plaque-associated microglia (a more local barometer of Aβ plaque-driven inflammation) were significantly more prominent in J20 CNR2−/− mice (Figure 3B). (A) Quantification of ICC Iba-1 staining in mouse hippocampus using Iba-1 monoclonal antibody. Data are means (no significant differences observed). (B) Quantification of plaque-associated microglia with Iba-1 in mouse hippocampus. Data are means and 95% confidence intervals. (C) Representative sections at 40x magnification reflecting average plaque-associated microgliosis in mouse hippocampus. *p < 0.05. To explore the relationship between microglial-driven alterations in amyloid deposition and tau pathology in the J20 mouse, total soluble mouse tau (assayed with DA31) ELISA and Ser396/404 phospho-tau (assayed with PHF1 ELISA) were compared between the J20 CNR2−/− mouse and the J20 CNR2+/+ mouse. Total tau was significantly reduced in J20 CNR2−/− mice (Figure 4A). A recent review of experimental manipulations of microglia in amyloid mouse models has reported that in published studies evaluating both amyloid and tau outcomes, changing the state of microglial activation has inverse effects on amyloid and tau pathology; experimental interventions that drive amyloid down as a function of microglial activity and phagocytosis (for instance, deletion of the fractalkine receptor, or the administration of LPS) increases tau pathology (42). The pathways connecting proinflammatory reduction of amyloid and tau exacerbation are not as yet clear. However, because experimentally enhancing microgial phagocytosis of amyloid may drive tau pathology, perhaps via factors released by the microglia themselves in response to these manipulations and not as the result of amyloid (42), it may be that the deletion of the microglial CB2 receptor in the context of amyloid-driven microglial activation reduces tau. (A) Quantification of soluble DA31 in hemisectioned brains of mice. Data are means and 95% confidence intervals. (B) Quantification of PHF1 in hemisectioned brains of mice. Data are means and 95% confidence intervals. (C) PHF1/DA31 ratio. *p < 0.05. Like other APP transgenic mouse models, J20 mice do not develop neurofibrillary tangle pathology. A previous study reported, however, that in the cortex and hippocampus of aged TgCRND8 amyloid mice, tau is hyperphosphorylated at the Ser396/404 epitope known to be a principal component of neurofibrillary tangles (43). To date, no studies have used ELISA to quantify soluble total tau and Ser396/404 phospho-tau in J20 mice. Our approach used ELISA because it has an advantage over Western blot and immunohistochemical approaches in its ability to give an exact quantification of protein concentration. Because there is no aggregated tau-forming neurofibrillary tangle pathology in transgenic amyloid mice such as the J20, most of the tau would be anticipated to be present in soluble form, making the soluble tau ELISA a sensitive approach. A previous study has demonstrated an inhibitory effect of CB2 receptor stimulation with JWH-133 on several tau kinases, including GSK3β, in an amyloid mouse model of AD, and a reduction in one phospho-tau epitope not investigated in the current study (14). For this reaseon, we anticipated elevations of soluble Ser396/404 phospho-tau in J20 CNR2−/− mice. However, levels of Ser396/404 phospho-tau were reduced in the J20 mouse relative to controls and in J20 CNR2−/− mice (Figure 4B). Of note, the JWH-133 stimulation reported (14) did not result in any modification in Aβ plaque deposition, a condition different from the current report. As noted above, microglial conditions that drive changes in amyloid may have a different impact on tau processing than conditions that do not. Because total tau was reduced in the J20 CNR2−/− mouse (as discussed above), and because DA31 includes all tau protein (even phosphorylated tau), we evaluated the ratio of Ser396/404 to total tau to evaluate the relative proportion of this pathogenic species represented in total tau. The ratio of Ser396/404 to total tau was decreased only in J20 CNR2+/+ mice relative to J20 CNR2−/− mice and controls (Figure 4C). This result suggests that in the J20 mice, there may be a shift in the relative activity of tau kinases, with a reduction in the kinases responsible for phosphorylating Ser396/404. The J20 CNR2−/− mouse, however, had an increase in the ratio of Ser396/404 phoshotau to total tau when compared with the J20 CNR2+/+ mouse. It may be that in the J20 CNR2−/− mouse, the mechanism responsible for the relative reduction of total tau precedes kinase-driven phosphorylation, such that there is a relative elevation of the Ser396/404 ratio in the J20 CNR2−/− mouse relative to the J20 CNR2+/+ mouse (Figure 4C) that does not reflect any difference in the activity of the responsible tau kinase. It is also possible that as CB2 receptor stimulation has been shown to reduce the activity of tau kinases and lower tau phosphorylation (14), there is a relative increase in kinase activity in CB2-deficient mice compensating for the reduction in the J20 mouse. The flourish of recent reports of the role of the CB2 receptor in AD (11) and of the CB2 receptor manipulation in mouse models of AD (13, 14, 15) suggest that the field of AD therapeutics is moving toward experimental cannabinoid interventions in humans, perhaps targeting the CB2 receptor. Of note, each of these studies focused on amyloid models of disease, and only one study included tau outcomes (14). Although the results of the tau-outcome experiment suggest a salutary effect on phosphorylated tau via CB2 receptor stimulation, the study only looked at one phosphorylation epitope (Thr181), and only quantified via immunofluorescent staining in the regions of plaques, and not throughout the cortex. Given the potential exacerbation of tau pathology achieved via microglial-targeted reduction of amyloid, including tau outcomes in amyloid models is important in evaluating the risks and benefits of moving forward with human trials (42). Although previous studies have evaluated changes in plaque deposition in response to manipulations of the CB2 receptor, no previous studies have evaluated the constitutive role of the CB2 receptor in reducing plaque deposition; the production of a transgenic APP/CB2 knockout mouse afforded the opportunity to evaluate the role of the microglial CB2 receptor without pharmacological intervention. J20 CNR2−/− mice had increased plaque pathology in the hippocampus, anterior cortex and posterior cortex. This result is consistent with one previous report (13) demonstrating the efficacy of oral canabinoid administration in reducing Aβ, although a subsequent study looking at a different compound found an improvement in cognition putatively mediated by microglial manipulation without alterations in levels of Aβ (14). While there was an increase in soluble, nonaggregated Aβ42 in the J20 CNR2−/− mouse, and while the mean levels of soluble Aβ40 were higher in the J20 CNR2−/−, elevations in Aβ40 did not reach statistical significance. A larger sample size may have yielded different results. It was anticipated that CB2 receptor deletion in the J20 mouse would result in an upregulation of microglial activation and that the CB2 receptor would enhance microglial chemotaxis, driven primarily by Aβ, via an endocannabinoid concentration gradient to the regions of plaque, such that, in knockout mice, there would be less plaque-associated microglia (44). Although we did find an increase in plaque burden in CB2 receptor-deficient mice, we had anticipated a broader microglial response reflected in increased Iba-1 staining. This result was suggested by a previous experiment in which CB2 receptor stimulation reduced Iba-1-positive microglia in TgAPP mice by >50% (13). It may be that downregulation of microglial response occurs only locally to plaques, in regions of increased endocannabinoid production; this is consistent with our finding of decreased plaque-associated microglia in CB2 receptor-sufficient mice. Although it is conceivable that microglial phagocytosis of plaque is enhanced by the activation of the CB2 receptor, it is also possible that this is observed only in the context of exogenous, rather than endogenous, stimulation. The reported results challenge the notion that the CB2 receptor, in the absence of exogenous stimulation, enhances chemotaxis of microglia to regions of plaque deposition, since receptor-deficient mice had more plaque-associated microglia. The enhanced presence of plaque-associated microglia in receptor-deficient mice together with enhanced plaque deposition also challenges the notion that increased recruitment of microglia to regions of plaque necessarily results in an augmentation of plaque clearance and suggests that microglial phagocytosis of Aβ in CB2 receptor-deficient mice may be relatively impaired. The specific advantage of CB2 receptor stimulation in successful phagocytosis of Aβ42 fragments has been previously demonstrated in vitro and, in the context of these results, underscores the need for further in vitro studies evaluating the potential negative impact of microglial CB2 receptor deficiency on phagocytosis (45). The reported diminution of total tau in the J20 CNR2−/− mouse in the context of elevations in Aβ is consistent with previous studies evaluating the impact of proinflammatory manipulations of microglia in amyloid mouse models, in which Aβ reductions were associated with increases in tau (42). In the absence of microglial manipulation, and in studies of tau mutants, levels of Aβ and tau have been more correlative. For instance, in one study of the TgCRND8 APP mouse, aged mice were found to have increased PHF1 immunoreactivity by Western blot relative to wild-type mice (43). Total tau proteins did not differ between TgCRND8 mice and nontransgenic age-matched controls. In studies of amyloid immune therapy in 3xTg-AD mice (that incorporate both amyloid and tau mutations), reductions in amyloid were also coupled with proteasome-dependent reductions in tau, including total soluble tau measured with ELISA (46,47). Although the relationship between Aβ deposition and tau production is complex, and experiments using different models may show relationships between these pathogenic proteins in different directions, it is clear that incorporating both Aβ and tau outcomes is critical to anticipate what may happen in experimental trials of human disease. The current report suggests that cannabinoid CB2-targeted interventions that reduce Aβ deposition may have altered tau proteins in undesirable directions. We would like to acknowledge the collaborative support of Heather Bradshaw and Ken Mackie of Indiana University.